Brides usually spend about 2-3% of the total wedding budget on invitations & paper supplies. That might not seem like a lot, but for the average $25,000 wedding that’s $700-$800, which is a lot to spend on paper! Why not have your invitation double as the favors? This can easily happen! By creating plantable invites you can give your guests a great memory when they plant the seeds embedded in your invitation to grow a garden. There are tons of options available online but be sure to check your local new age paper supply stores to see if they can beat the prices. Some are made from seed paper, and other contain packets of seeds. 2 Eco-friendly Florals & Accessories. Decorations & Bridal Accessories make up another big chunk of the wedding budget. You can kill two birds with one stone by recruiting your family, friends, and bridal party to plant wildflowers (either mixed or of your chosen color) to grow for your big day. You can use them to decorate, for the flower girls to toss before you walk down the aisle, and even in your hair. Or if you have enough resources the arrangement can become over the dominant decoration feature of the actual ceremony. This requires time, so check the package of your seeds to see how long they take to grow to make sure you have enough time before your big day to get all the ones you need. This not only saves you money, but helps lessen your footprint on the environment AND can be super fun. By choosing unique wedding venues early in the piece you can really match your choice of flower to the location to make it feel cohesive and pull off a truly beautiful picture. Note: It is a good idea to have a backup source for flowers. For those who make the environment a priority when planning events, there’s no better option than getting a caterer who uses eco-friendly food. Before you book a caterer, be sure to ask about the foods that they serve. There are certain words you should be on the lookout for, including “sustainable,” “organic” and “free range.” This usually means that the caterer has obtained their meats, fruits and vegetables from local farmers who don’t use unnatural additives, fertilizers or hormones in their products. Factory farming creates a lot of pollution in both the air and the soil, while small, local farmers do not. Furthermore, local products don’t have to travel as far to be sold, meaning that less fuel is burned in the process of getting those foods to your table (which means less of a carbon footprint). You’ll also want to be sure that your caterer uses actual dishes, silverware, tablecloths and napkins rather than disposable plastic to serve your guests. This reduces the waste because dishware and linens can be used over and over again. If budget is your concern, see if the catering company can use biodegradable products made from recycled materials whenever possible. For more on shopping locally, visit this site. For drinks – consider options like lemonade, iced tea, or other similar drinks that are easy to make and that you can control what goes into them so you don’t end up with anything over-processed. For alcoholic beverages, consider buying locally. You’ll help the local economy and can find unusual and tasty alternatives to the big name brand options. Make sure you have someone certified at your bar station though – check with your local township on those requirements. 4 Make The Bride & Bridesmaids’ Hair Sustainable. 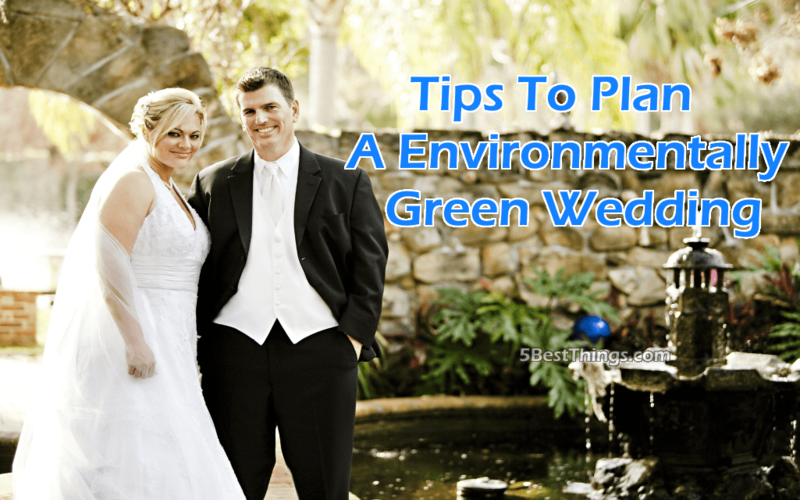 f you want to stay eco-friendly, the most cost-effective option is to use biodegradable & eco-friendly products and do something simple that you or your bridesmaids can do for you. If you want that fancy updo, look into finding a salon that is environmentally conscious and uses eco-friendly products. Braids can be very dramatic and do not require a lot to create. Research shows that the average woman applies as many as 515 chemicals in her daily grooming and makeup routine. These potentially toxic additives can not only harm human health, but also pose problems for the environment in the form of PPCPs (pharmaceuticals and personal care products as pollutants). You can find eco-friendly & chemical free cosmetics to help lessen the overall impact on not only your skin, but also the environment.